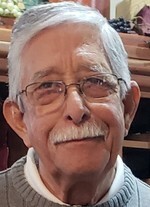 Hector Lujan Gonzalez, 74, a longtime resident of Alamogordo, died Friday, March 29, 2019, in Alamogordo. Hector was born June 19, 1944 in Las Cruces to Tomas and Romancita Lujan Gonzalez. He attended school in Las cruces and graduated from Las Cruces High School in 1962. Hector joined the US Navy in 1963 and served in several stations including San Diego, San Francisco and Cuba, as a Shore Patrolman and as an interpreter, until his honorable discharge in 1969. He then worked for Land-Air at Salinas Peak until 1970 when he joined Civil Service, where he worked for 39 years, first in the Army Air Operations Directorate at Holloman Air Force Base, then in the Data Sciences Directorate at White Sands Missile Range. During his tenure with Civil Service, Hector received several awards, including a Medallion in Appreciation of Contribution to Success and Outstanding Support performed during the First Manned Orbital Flight of the Space Shuttle (1981); for Significant Contribution to Progress of the U.S. Space Transportation System Through Service in the Department of Defense Support Operations (1982); and upon his retirement in 2009, the Commander’s Award for Civilian Service. From its inception in 1989 until his retirement he was involved in the planning and coordination of the Bataan Memorial Death March. Since his retirement, Hector was quite proud to be one of the volunteers at Desert Lakes Golf Course, getting the golf carts ready each day. He was an avid golfer who played three times a week; a member of the Alamogordo Men’s Golf Association; a former member of the Alamogordo Noon Lions Club; a member of the B.P.O. Elks Lodge; a fanatic supporter of Texas Tech University sports; and a member of Grace United Methodist Church where he and his wife Grace assisted in serving communion. Survivors include his wife of 48 years, Grace Maldonado Gonzalez; a daughter, Tera Gonzalez of Benica, California; a son, Brandon Gonzalez and his partner, Greg Bench of Seattle, Washington; a brother, Ruben Gonzalez of Mimbres, New Mexico; a sister Anna Laboy of Phoenix, Arizona; numerous nieces, nephews and cousins; and a host of friends. Hector was preceded in death by his parents; a sister, Eloisa Gonzalez; and a sister-in-law Patsy Gonzalez. A memorial service will be conducted today, April 2, 2019, at 10:00 a.m. at Grace United Methodist Church, Cuba Avenue and 16th street, in Alamogordo, with the Reverend Dustin Wilhite officiating. Military honors will be provided by the Navy. Should friends desire, memorial contributions may be made to the Otero County Golf Foundation, 2351 Hamilton Road, Alamogordo, NM 88310. To send flowers to the family of Hector Lujan Gonzalez, please visit our Heartfelt Sympathies Store.